The worlds best tasting fish and shellfish products come from the cool, clear waters on and around the Hebridean Island of Mull. It was here in the 1780’s that the British Society for Encouraging Fisheries decided to build a port upon a wonderful natural harbour among these seas of abundant fish. The name of the port was Tobermory. 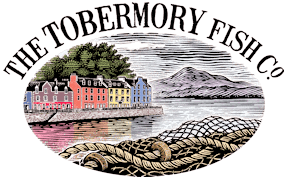 Situated in the beautiful town of Tobermory, The Tobermory Fish Company was founded in 1971 by Hugh and Marjorie Goldie and is, today, an award winning, small, family-run business with a strong family and island heritage passed through three generations. For nearly 50 years the Company has been producing foods of the highest quality, using fish and shellfish from the very best local and Scottish suppliers. Hugh and Marjorie believed in a family business with a family of customers. This tradition is continued by their daughter, Rosie and granddaughter Sally both of whom who take great pride in producing outstanding foods. That commitment that customers should taste the finest fish and seafoods is maintained through the following core values. The Tobermory Fish Company’s overall objective is to make delicious produce that instils the spirit of our amazing location by embracing the purity and beauty of the surrounding environment. Our selection of delicious Hebridean foods range from the world renowned cold smoked Tobermory Trout to hot smoked Smoked Mussels. 1971 Tobermory Marine Fish Farm established as a pioneer marine fish farm with young fish raised in Hugh and Marjorie’s garden stream. 1976 First “Smokehouse” established in their garage. 1978 Smoked foods were produced as a "cottage industry" behind the Fish Farm shop on Tobermory Main Street. 1980 Mail order introduced and the Company is soon supplying many well know personalities. 1988 Tobermory Trout featured as an episode focus in the iconic television series “All Creature Great and Small”. Late 1990’s Hugh and Marjorie sadly both die. 2003 Tobermory Trout wins Great Taste Gold Award followed by various others. 2011 The Tobermory Fish Smokehouse is refurbished to modern standards for food production and trading commenced through retail, wholesale and mail order channels. 2012 Double HIE Food and Drink award winner. 2013 Electric Vehicle purchased for deliveries on Mull. 2017 Company featured on BBC Landward programme.